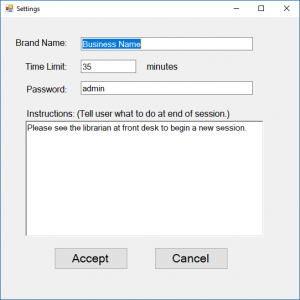 The program allows branding of business or organization in the settings menu and will display that brand name at the top of the Timed Session’s blocking page. As well as an instructions box that can be customized to give any needed instructions on usage to the user. Below is a picture of the simple settings box, here you can change the following. 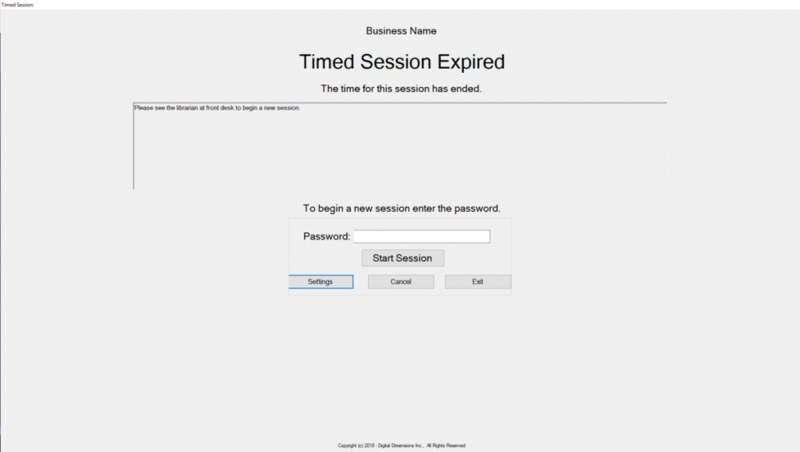 The Timed Session program will only block the users screen when the session ends. It is non destructive to the users activities, meaning it will not close or end any programs the user was currently running. Audio cues activate at the start and end of a session that can alert administrators and user that the session has started or ended. When the program is installed it will add itself to the Startup programs menu which will cause it launch when the computer boots into windows. You can remove this feature by removing it’s listing from the Startup menu section in windows. When you start the program for the first time the password is set to “admin” (without the quotes.) You should change this right away.